1 E Atmospheres and millimeters of mercury (also written as mmHg or torr) are units of pressure used in the measurement of gas properties. Partial pressure is the only property listed that is measured in units of pressure. 2 B Molality (m) is the measure of moles of solute present per kilogram of solvent. It is the only answer choice that measures moles per kilogram. Molality differs from molarity (M) in that molarity is the measure of moles of solute per liter of solution. 3 D Density is the measure of the mass of gas, liquid, or solid within a given volume. 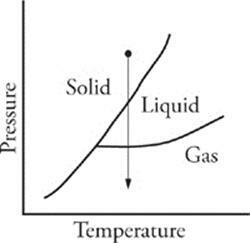 The densities of liquids and solids are relatively independent of their surroundings, while the density of a gas depends on the size of the container in which it is confined. 4 B Molality (m) is used in the calculation of boiling point elevation according to the formula: ΔT = kbmi, where kb is the boiling point elevation constant for a solvent, m is the molality of the solution, and i is the van't Hoff factor, which tells how many particles 1 unit of the solute will create when it dissociates. Molality is also used in the calculation of freezing point depression. 5 A Liquid water (H2O) contains hydrogen bonds between the hydrogen atoms of each molecule and the oxygen atoms of neighboring molecules. Many of water's distinctive properties, such as the fact that it has a lower density as a solid than as a liquid and that it has a relatively high boiling point, are due to hydrogen bonding. 6 D Liquid oxygen is held together by London dispersion forces, which are very weak attractions between molecules. London dispersion forces are the only type of intermolecular attractions that exist in nonpolar molecules, such as O2. London dispersion forces occur because of instantaneous charge imbalances in molecules. Most substances that experience only London dispersion forces are gases at room temperature. 7 C Diamond owes its great strength to the fact that its carbon atoms are bonded together in a tetrahedral network of covalent bonds. This tetrahedral structure means that diamonds have no natural breaking points and are thus very difficult to shatter. 8 E Solid copper is held together by metallic bonding. When elements are held together by metallic bonds, positively charged nuclei float in a sea of mobile electrons. The electrons move freely from nucleus to nucleus. This electron mobility is responsible for the distinctive properties of metals such as conductivity and malleability. 9 B Solid KCl (potassium chloride) salt is held together by ionic bonds. The positively charged potassium ions and the negatively charged chloride ions are held together by the electrostatic force between them. Remember: The electrostatic force comes from the attraction between two atoms that differ very significantly in electronegativity and is very strong. 10 C Fluorine (F) has 7 electrons in its second shell, 1 short of a complete stable octet. 11 B Aluminum (Al) has 3 electrons in its third shell, 2 in the s subshell, and 1 in the p subshell. 12 A A positively charged sodium ion (Na+) has given up the 1 electron from its third shell, so it has the same electron configuration as a neon atom, which has a completed second shell. 13 D D is correct. Titanium (Ti) is a transition metal and has 2 electrons in its 3d subshell. 14 C The solution containing Cu2+ ion will be blue. Most solutions containing salts of transition metals are distinctly colored because the d subshell electrons of transition metals absorb and emit electromagnetic radiation in the visible spectrum. 15 A HNO3 is a strong acid, so it will dissociate completely in solution. That means that a 0.01-molar solution of HNO3 will have a hydrogen ion concentration of 0.01-molar. pH is –log[H ], and –log(0.01) = 2, so the pH of the solution will be 2. 16 C Freezing point depression is a colligative property, which means that it depends only on the number of particles in a solution, not on their identities. For every unit of Cu(NO3)2 in a solution, 3 particles are produced: 1 Cu2+ and 2 NO3−. For all of the other choices, each unit in solution produces only 2 particles. 17 B HC2H3O2 (acetic acid) is a weak acid, which means that it does not dissociate significantly in solution. That means that most of the particles present in the acetic acid solution will be undissociated HC2H3O2. All of the other solutions listed contain solutes that dissociate completely. 18 E The specific heat capacity is the amount of energy that must be added to raise the temperature of 1 gram of a substance 1°C. If a substance has a large specific heat capacity, it can absorb a large amount of heat while undergoing a small temperature change. 19 C The value of the Gibbs free energy change (∆G) for a reaction indicates the spontaneity of the reaction. If ∆G is negative, then the forward reaction is spontaneous. If ∆G is positive, then the reaction is not spontaneous. If ∆G is zero, then the forward reaction is at equilibrium. 20 A The value of the enthalpy change (∆H) for a reaction indicates whether the reaction is endothermic or exothermic. If ∆H is positive, energy is absorbed over the course of the reaction, and the reaction is endothermic. If ∆H is negative, energy is released over the course of the reaction, and the reaction is exothermic. 21 B Electronegativity indicates how strongly an atom will attract the electrons of another atom in a bond. The larger the electronegativity difference between two atoms in a bond, the more polar the bond will be. 22 A Ionization energy is the energy required to remove an electron from an atom or ion. The larger the ionization energy, the more difficult it is to remove the electron. 23 D The atomic number, which determines the identity of an element, is equal to the number of protons in the atom's nucleus. The mass number is equal to the sum of the protons and neutrons in an atom's nucleus. Atoms with the same atomic number and different mass numbers are isotopes. 101 F, T Divide and conquer. The first statement is false. Neither the electrons nor the ions in an ionic solid are free to move about, so an ionic solid will not conduct electricity. The second statement is true. An ionic solid is composed of positive and negative ions joined in a lattice structure by electrostatic forces. The first statement is false and the second statement is true. 102 T, T, CE Divide and conquer. Both statements are true. Since the oxygen atoms are identical to each other, they will have equal attraction for the bonding electrons. The second statement is a correct explanation for the first statement, so we fill in the CE oval. 103 T, T, CE Divide and conquer. Both statements are true. Ice has stronger intermolecular forces and more stability than water, so when water freezes, energy is released. The second statement is a correct explanation of the first statement, so fill in the CE oval. 104 T, T Divide and conquer. The first statement is true. For an aqueous solution at 25°C, pH + pOH = 14. The second statement is also true. The definition of a buffer is a solution whose pH is not easily changed by the addition of an acid or base. Now, ask yourself if the word “because” relates the two statements. The second statement does not explain the first statement, so do not fill in the CE oval. 105 F, T Divide and conquer. The first statement is false. When an atom gains an electron, it becomes a negatively charged ion. The second statement is true. Protons are positively charged and electrons are negatively charged, so an atom that has equal numbers of protons and electrons will be electrically neutral. The first statement is false and the second statement is true. 106 F, F Divide and conquer. The first statement is false. As you travel across a period on the periodic table, from left to right, ionization energy increases. That's because as we move across a period, we are adding protons to the nucleus, which increases the pull of the nucleus on the valence electrons, making them more difficult to remove. The second statement is also false. The same reasoning applies here; oxygen's nucleus has more protons, so oxygen exerts a greater pull on its electrons. As a result, oxygen's valence electrons will be closer to the nucleus than lithium's, making its atomic radius smaller. Both statements are false. 107 T, T, CE Divide and conquer. The first statement is true; potassium chloride (KCl) is a soluble salt. The second statement is also true. The second statement is a correct explanation of the first statement because we know that like dissolves like, so ionic solids are best dissolved by polar solvents. Both statements are true and we fill in the CE oval. 108 T, T, CE Divide and conquer. Both statements are true; we know that ammonia (NH3) is a Lewis base and that a Lewis base is an electron pair donor. The second statement is a correct explanation of the first statement—;the statements together give us the definition of a Lewis base. We fill in the CE oval. 109 T, T Divide and conquer. The first statement is true. Fluorine is more reactive than neon because it needs 1 electron to complete its valence shell, while neon has a complete stable octet of electrons in its valence shell. The second statement is true. Neon has an atomic weight of 20.2 g/mol, while fluorine has an atomic weight of 19.0 g/mol. Now see if the second statement explains the first. Fluorine is more reactive than neon for the reason given above, not because of its atomic weight, so the second statement does not explain the first. Both statements are true, and we do not fill in the CE oval. 110 F, T Divide and conquer. The first statement is false. The enthalpy change (∆H) for a reaction is unaffected by the addition of a catalyst. The second statement is true: A catalyst increases the rate of a reaction by decreasing the activation energy of the reaction. The first statement is false and the second statement is true. 111 T, T Divide and conquer. The first statement is true. In water (H2O), the oxygen atom gains 2 electrons and takes the –2 oxidation state while each of the 2 hydrogen atoms gives up an electron and takes the +1 oxidation state. The second statement is also true. Water does exhibit hydrogen bonding. Now, ask yourself whether the second statement is an explanation of the first. The two statements are not related. Both statements are true, and we do not fill in the CE oval. 112 T, T, CE Divide and conquer. Entropy is a measure of disorder, and aqueous ions have greater disorder than ions in a solid, so both statements are true. The second statement is a good explanation of the first statement because knowing that aqueous ions have greater entropy than ions in a solid, we can see why entropy increases in solution. Both statements are true, and we fill in the CE oval. 113 T, F Divide and conquer. The first statement is true. From Le Chatelier's principle we know that when temperature is increased, an equilibrium will move in the direction that will absorb the excess heat; that's the endothermic direction. The second statement is false. A reaction reaches equilibrium when the rate of the forward reaction is equal to the rate of the reverse reaction, not when all the reactants have been converted to products. The first statement is true and the second statement is false. 114 F, T Divide and conquer. The first statement is false. A carbon atom always contains 6 protons. The number 12 is the mass number, which is the sum of the protons and neutrons in the nucleus. The second statement is true. The number of protons in an atom is the atomic number and gives the element its identity. The first statement is false and the second statement is true. 115 T, F Divide and conquer. The first statement is true. Water's vapor pressure increases when heat is added, and water boils when its vapor pressure is equal to the atmospheric pressure. At high altitudes, atmospheric pressure is decreased, so water will boil at a lower temperature. The second statement is false. The vapor pressure of water is unaffected by altitude. The first statement is true and the second statement is false. 116 T, T, CE Divide and conquer. Both statements are true. A strong reducing agent is readily oxidized. Remember LEO says GER: When something is oxidized, it loses electrons. A sodium atom has only 1 valence electron, which it gives up readily, so it is easily oxidized. Therefore, elemental sodium is a strong reducing agent. The second statement is a good explanation of the first statement. Both statements are true, so fill in the CE oval. 24 E The oxidation states of all of the atoms in a neutral molecule must add up to zero. We know that oxygen almost always takes the oxidation state –2 and that hydrogen is almost always +1, so we know that (+1) + (Br) + (3)(–2) = 0. This makes the oxidation state of bromine +5. 25 C The molecular formula of silicon dioxide is SiO2, so the molecular weight is (28) + (2)(16) = (28) + (32) = 60. The percent by mass of silicon is equal to × 100, which is slightly less than 50 percent, or 46 percent to be exact. 26 C The number of electrons in a chloride ion with a –1 charge will be one greater than the number of its protons. A chlorine atom or ion always contains 17 protons, so a chloride ion with a –1 charge will possess 18 electrons. 27 B From the balanced equation, we can see that when 2 moles of O2(g) are consumed, 800 kJ of energy are produced. So when half that number of moles of O2(g) (1 mole) is consumed, half as much energy is produced (400 kJ). 28 D All of the statements are true except choice (D). Sodium is not found in nature as a diatomic gas; it is usually seen in nature in ionic salts. 30 C Plug the answers into the equation. If the coefficient for H2O is 3, then there are 6 hydrogens and the coefficient for PH3 must be 2. That makes 1 the coefficient for P2O5. Now we have 8 oxygens on the right, so the coefficient for O2 on the left must be 4. Since we have 1 as a coefficient for one of the species in the reaction, these must be the lowest whole number coefficients, and (C) is correct. 31 E First, look at your reactants: You have an acid and a base, so you know that they will neutralize one another. Now write out the products. Note that in this problem, you don't need to balance anything; just figure out the type of reaction and the products. The products of an acid-base neutralization (when the base is a metal hydroxide) are water and salt. In this case, the salt is barium sulfate. 32 C We need to determine the limiting reagent. Magnesium has an atomic weight of about 24 g/mol, so 48 grams of magnesium is 2 moles. O2 has a molecular weight of 32 g/mol, so 64 grams of O2 is about 2 moles. We need twice as much Mg for the reaction, so we'll run out of it first; magnesium is the limiting reagant. Two moles of Mg will produce 2 moles of MgO, which has a molecular weight of 40.3 g/mol, so we end up with 80.6 grams of MgO. 34 B The partial pressures of the two gases will be the same because partial pressure of a gas is directly proportional to the number of moles of the gas present, and we have equal numbers of moles of the two gases. The average kinetic energies of the two gases will be the same because the average kinetic energy of a gas is directly proportional to absolute temperature and the two gases are at the same temperature. The average molecular velocities will differ because when two gases have equal kinetic energies, the molecules of the gas with lower molecular weight must be moving faster on average. 35 A CO2 is a nonpolar molecule although it contains polar bonds. That's because carbon dioxide has its 3 atoms arranged in linear fashion, with its negatively charged oxygen atoms on the ends. There is a partial positive charge on the carbon atom. Due to the symmetrical arrangement of 2 equivalent polar bonds, the overall molecule has no net charge. 36 B Knowing that moles = , we can calculate the number of moles of CaBr2 in the solution. 38 A From the balanced equation, we can see that there will be twice as much H2 consumed as there is N2 produced. 39 D Plug the answers into the reaction, and see which one works. Let's start at choice (C) because it's in the middle. If there are 3 H+, then there can't be a whole number coefficient for H2O, so the answer can't be an odd number. So the answer must be (B) or (D). Try (D). If there are 4 H+, then there are 2 H2O. The coppers are in balance if each has a coefficient of 1. Notice that this makes the net charge on the right side +2. With 4 H+, the charge on the left is +4, but the negative charge on the nitrate balances it out. The equation is now balanced with the lowest whole number terms. 40 A In the course of this reaction, Cu0 is converted to Cu2+. Remember LEO says GER; Cu has lost electrons, so it has been oxidized. By the way, NO3− is reduced in the reaction, and the oxidation state of H+ is not changed. 41 E A molecule's empirical formula is its molecular formula with numbers reduced to lowest whole numbers, so if the empirical formula is CH2, then its molecular formula must be C3H6. 42 C CO2 combines with water to form carbonic acid (H2CO3). Carbonic acid is a weak acid, so it will release H+ ions into the solution. When the concentration of H+ increases, the pH decreases. 43 C Entropy is the measure of a system's randomness, and gases are more random than liquids. Also, the more molecules, the greater the randomness. In choice (C), a liquid is converted into two gases, and the number of molecules is increasing, so entropy must be increasing. 45 B Gamma decay involves the release of electromagnetic radiation, which has no electrical charge. Alpha particles are positively charged, and beta particles are negatively charged. 46 D The solubility product (Ksp) of a molecule is a measure of the concentrations of the particles into which it dissociates in solution at equilibrium. Since all of these salts will ionize into two ions per unit, the salt with the largest value of Ksp will be the most soluble. 47 D The acid dissociation constant (Ka) is an equilibrium constant, with the concentrations of the products in the numerator and the concentrations of the reactants in the denominator. 48 B A catalyst lowers the activation energy of a reaction but does not change the potential energy of the starting materials or products. Choice (A) actually raises the activation energy, and (C), (D), and (E) change the energies of the reactant or product. Choice (B) is correct. 49 A When an electron jumps from an excited state to a more stable state, energy is released by the atom. This energy is released in the form of electromagnetic radiation. In the reverse process, an atom may absorb electromagnetic radiation, and its electrons may jump to excited energy levels. 50 E Use the ideal gas equation, PV = nRT, and solve for n, the number of moles of gas. Don't forget to convert 25°C to 298 K.
51 C Pressure and temperature will not be changed as long as the number of moles of gas in the vessel doesn't change. The density of the gas will decrease because equal numbers of moles of helium and neon will have different masses, and density is the measure of mass per unit volume. 53 D If the reaction is being used to provide energy to electrons, it must have a positive reaction potential or voltage. In the same way, if the reaction is being used to provide energy to a circuit, it must be spontaneous (∆G is negative). 54 B A buffered solution is made up of a weak acid and its conjugate base (or weak base and its conjugate acid). Carbonic acid (H2CO3) and bicarbonate ion (HCO3−) are the only examples of this type of pairing in the answer choices. Choices (A) and (E) represent strong acids and their conjugates, choice (C) represents a salt, and choice (D) represents a strong base. 55 E Ammonia (NH3) is a base, which means it can accept a proton or H+ ion. NH3 accepts a proton to become NH4+. 56 B We know that pH + pOH = 14 and that [H+][OH−] = 1 10–14 at 25°C. Now we use Avogadro's number (6.02 1023) to find the number of atoms in the sample. 58 B The half-life of a radioactive material is the time that it takes for half of the sample to decay. After 1 half-life, 50 percent of this sample remains; after 2 half-lives, 25 percent remains. If two half-lives are 40 minutes, then 1 half-life is 20 minutes long. 59 C Potassium (K) is in group 1A of the periodic table, between sodium (Na) and rubidium (Rb). We know from our knowledge of periodic trends that the value of potassium's first ionization energy will fall between that of sodium and rubidium. 60 D In the expression for the equilibrium constant, the products are in the numerator, the reactants are in the denominator, and the coefficients become exponents. So the correct expression is K = . 61 E According to Le Chatelier's principle, equilibrium shifts to relieve any stresses placed on it. If NOCl is added, the equilibrium will shift to the right, and the concentration of Cl2 will be increased, so I is wrong. If NO is added, the equilibrium will shift to the left and decrease the concentration of Cl2, so II is correct. If the volume is decreased, the equilibrium will shift to the left, which has fewer moles of gas, and the concentration of Cl2 will be decreased, so III is correct. 62 A We can see from the balanced equation that for every mole of NOCl consumed, 1 mole of NO is produced, so choice (A) is correct. 63 D Organic chemistry is the study of carbon compounds. Methane (CH4) is the only compound listed that contains carbon. 64 C The equivalence point in a titration is the point at which enough base has been added to neutralize all the acid that was initially present in the solution. This point is in the middle of the steep part of a titration curve. In this case, when a strong acid is titrated by a strong base, the pH at the equivalence point will be 7, and the solution will be neutral. 65 B The atomic mass of fluorine is 19; the atomic number, which is the number of protons in the nucleus, is 9. All of the other statements about fluorine are true. 66 E Atoms react with other atoms to fill their valence electron shells, so the single most important factor in determining the reactivity of an atom is the makeup of its valence electron shell. 67 A The addition of sodium chloride (NaCl) will introduce more Cl− ions to the solution. Because of the common ion effect, these Cl− ions will affect the equilibrium of the copper(I) chloride (CuCl) with its dissociated ions. The addition of extra Cl− ions will cause the reformation and precipitation of CuCl. 68 D The rule with chemical pH indicators is simple: They change color at a pH that's about equal to their pKa. Therefore, if bromothymol blue has a pKa around 7, it will change color around pH 7. 69 B If a nonionic substance has a high boiling point, that means that a large amount of energy must be put into the substance to overcome its intermolecular attractions and convert it to the gas phase. So a high boiling point is an indication of very strong intermolecular attractive forces.